In Part 1 we looked at the hardware of the DAP-1520 and did some investigation into the stock D-Link firmware that runs on the device. We found that there were two firmware images on the device, the main firmware (Image 1) and the recovery OS (Image 2) which is used when Image 1 fails verification. Despite D-Link’s reputation for buggy firmwares, my infosec skills are still basic, and I wasn’t able to get telnetd running on the DAP-1520 to investigate the firmware more. Sure, we already have a dump of the firmware thanks to an SPI reader (and the update, available from D-Link’s website), but this only tells us what’s in the firmware, it doesn’t actually let us poke around at the hardware. Since my stated goal is to get OpenWrt running on the device, poking around at the hardware with a working OS is pretty important. 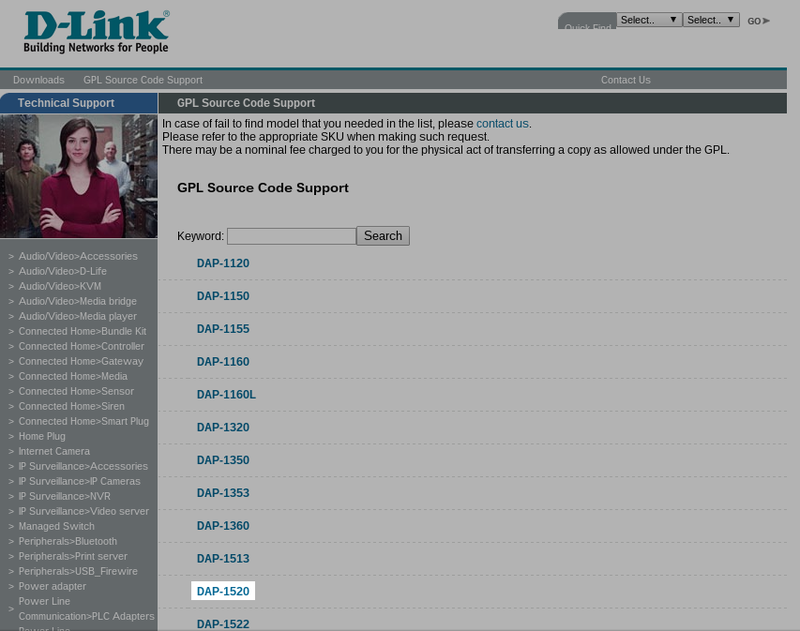 To accomplish this, I needed to build the firmware from the GPL source code published by D-Link. You can download the GPL source code for their routers from their Taiwanese website. I’m building firmware 1.06, since newer is always better. 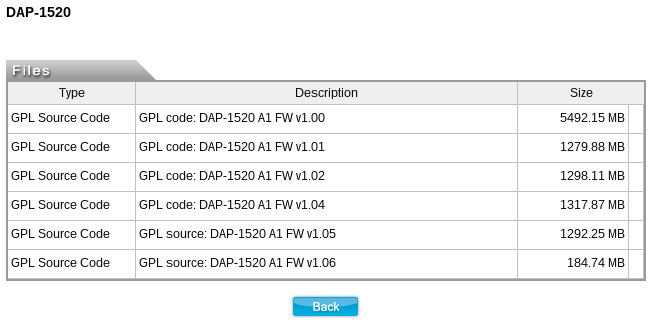 I’ve just noticed that D-Link have published a file for firmware 1.07 on their Australian website. Hopefully they will release the GPL source for this firmware soon, I’m excited to see what vulnerabilities have been addressed in the web configurator! Anyway, when you download the GPL source code, you will find that D-Link has included a README file, which describes how to build the firmware. This surprised me, I wasn’t expecting anything more than the source code, so some minor kudos go to D-Link for at least providing instructions. 2. Install Ubuntu 10.04.4 LTS server in your computer. 3. Make sure your Ubuntu is 10.04.4 LTS(Lucid Lynx). 4. Building image with ROOT privileges. 4. Building the image & loader. (3). You will get "AthSDK" directory. (4). Into the AthSDK directory,and run following commands. After make successfully, under "AthSDK/image/", you will get the normal image file "DAP1520A1_FW106B04.bin". After make successfully, under "AthSDK/image/", you will get the backup image file "DAP1520A1_FW100B03.bin". After make successfully, under "AthSDK/image/", you will get the loader file "DAP1520A1_FW100.boot". 5. Update the new firmware by web interface provided by device. 6. Congratulations! You got your specific image now. Install Ubuntu 10.04? Thanks, I think I will pass. Ubuntu 10.04 isn't supported anymore, so good luck installing all the packages you need to support the build environment. So, instead I decided to build the firmware on my laptop, which runs a reasonably current version of Arch Linux. On Arch Linux /tmp is a ramdisk, so I just do all my work there and make symlinks when necessary. I wouldn't recommend using /tmp for work unless you have >8GB of RAM as the /tmp filesystem is by default 50% of your RAM, and the compiled source code is somewhere around 2GB give or take. The first step is to decompress the toolchain and create a symlink from DAP-1520_A1_106b04_FOSS/toolchain/ to /opt/buildroot-gcc342 because a bunch of their makefiles are hard coded to look in this place for the toolchain. Then you'll need to compile the versions of lzma and squashfs provided, for reasons which I will get into in a bit. Copy the lzma and mksquashfs_lzma-4.2 binaries into the bin folder of your toolchain. I don't recommend running make install as they do in the instructions, just run make and manually copy the binaries to the toolchain/bin directory. The copy of mksquashfs_lzma-4.2 included in the toolchain links against an ancient version of liblzma.so which has long since not existed in Arch Linux. Hence, it's easier just to compile the version from the source code included. Just install xz from your package manager, I didn't need to compile their specific version. At this point, we need to fix some of the source files or the compilation will fail. You will need to download and run the next few patches in the AthSDK directory or compilation will fail with errors. Compiling the kernel will fail because Arch has a reasonably new verison of Perl, and the syntax in Perl >5.22 has changed since 2.6.36. You will need to apply the patch timeconst.patch to fix this. Compiling busybox will fail because the syntax in the makefile is deprecated. You will need to apply the patch busybox_makefile.patch to fix this. We want to have telnetd and nc in the image we create, for backdoors and stuff. You will need to apply the patch busybox_features.patch to enable these features. D-Link includes an application called timer which expects an object file to compile, except this object file is never created. Removing the line fixes the error and as far as I know timer still works as intended. You will need to apply the patch timer_makefile.patch to fix this. Creating 4.0 filesystem on /home/AthSDK/image/MT7620-squash, block size 65536. We need to verify that the file produced matches the official firmware update available from D-Link. It really wouldn't do to flash an XZ compressed kernel when the bootloader expects an LZMA compressed kernel! 0             0x0             uImage header, header size: 64 bytes, header CRC: 0x9D3D95E7, created: 2016-03-07 19:18:42, image size: 909160 bytes, Data Address: 0x80000000, Entry Point: 0x8000C310, data CRC: 0x77D76472, OS: Linux, CPU: MIPS, image type: OS Kernel Image, compression type: lzma, image name: "Linux Kernel Image"
Good, this matches the D-Link provided firmware update, so we should be all good to flash it to the router and see if we can login. I had originally installed mksquashfs from pacman, because why would you want to use the old version included in the D-Link source? Hilariously, the version of mksquashfs_lzma-4.2 included in the D-Link source doesn't actually support LZMA compression at all, instead using xz compression by default! This differs from mksquashfs included in Arch Linux, which uses gzip by default! If you just go ahead and build the image using mksquashfs provided by your package manager, you will end up with a filesystem which is too large, and the build process will fail! -3 .. -9          good to excellent compression. -7 is the default. Memory usage depends a lot on the chosen compression mode -1 .. -9. See the man page lzma(1) for details. Compress or decompress FILEs in the .xz format. decompressor memory usage into account before using 7-9! Report bugs to  (in English or Finnish). So, apart from the newer output looking much more like a standard GNU utility, you might have noticed that the older copy of lzma compresses with a default compression of -7 while the newer version compresses with a default compression of -6. If you think this doesn't make a difference, let me just tell you now, it does. A big one. The difference between -6 and -7 is the difference between a kernel that boots, and one that doesn't. 0             0x0             uImage header, header size: 64 bytes, header CRC: 0x46768407, created: 2016-03-05 22:33:15, image size: 909272 bytes, Data Address: 0x80000000, Entry Point: 0x8000C310, data CRC: 0x4993B2D9, OS: Linux, CPU: MIPS, image type: OS Kernel Image, compression type: lzma, image name: "Linux Kernel Image"
0             0x0             uImage header, header size: 64 bytes, header CRC: 0x7A57558F, created: 2016-03-07 20:41:46, image size: 908147 bytes, Data Address: 0x80000000, Entry Point: 0x8000C310, data CRC: 0x8E0F6C03, OS: Linux, CPU: MIPS, image type: OS Kernel Image, compression type: lzma, image name: "Linux Kernel Image"
So, what exactly happens when you flash this image to the device? Does it do some verification before flashing and stop you? Does it flash the image, and then when Image 1 fails to boot it boots the linux4b image and start rootfsb so you can recover the device? So, no. No verification of the validity of the kernel in the update before flashing. And no, it won't boot from Image 2. You will just see this error, over and over, while the device resets. You might think that Image1 Try Counter would increment, and after a threshold it would boot into the recovery environment, but no. Congratulations, you are now the proud owner of a brick. Get out your SPI flashing tool, because there's no other way around this disaster. This does beg the question, how do you get the device to boot into Image 2? Well, after the LZMA compression snafu on the kernel, I thought I would save some time and just flash the vmlinuz.ub file created by the build script to flash and be done with it... nope! When you do flash a working firmware back onto the router, you get a surprise when it boots. Because Image1 is borken!! the device rewrites all the nvram variables to their defaults. nvram_sanity_check: restore key: pure_model_description="Wireless Repeater"
nvram_sanity_check: restore key: pure_device_name="D-Link Systems DAP-1520"
nvram_sanity_check: restore key: model_name="D-Link Repeater"
Solid defaults there, D-Link. I think this is the first device I've ever encountered where the admin password was actually blank. I setup the device initially, and then it rebooted and asked me for a password to login. Even working in IT, I never thought to try an empty password. I mean, who does that?! D-Link does that. And just while writing this I realized that I can look at the nvram defaults any time I want to in /etc/nvram.defaults. This is why you use the 15 minute rule, people. Below is a firmware with nc running on port 8023 if you have a DAP-1520 and you want to poke around the D-Link firmware. Telnet asks for a username and password, and none of the combinations I could think of let me login. Firmware DAP1520A1_FW106B04.bin (gzip compressed) with nc backdoor. This entry was posted in Embedded, Linux, Networking and tagged d-link, dap-1520, dd, firmware, squashfs, WiFi on 2016/03/12 by Hal Martin. Could you compile a DAP-1520 firmware (1.06) with the extender 2.4GHz radio locked to channel 5 ? It doesnt have a channel configuration page and the best channel that works for me here is 5. Hi Bruno, I’m very sorry but I no longer have the DAP-1520. You can follow the instructions and compile the D-Link firmware yourself if you’d like to modify the settings. Hi Hal, no problem. I know it’s been a while, but only now i got the time to mess with this stuff. I’ve successfully compiled the 1.06 GPL Sources on both Ubuntu 10.04 (following D-Link original instructions) and Ubuntu 17.10 (by applying some of your patches). On both i end up with consistent “.bin” files (different of course). But i have a problem, i tried to make some small changes to some source files, just to check if i was really building a valid custom firmware, but the changes i make have no effect on the final bin file ! So i opened the “/home/AthSDK/apps/lighttpd/lighttpd-1.4.28/src/network.c” and changed the text, added an extra “Test” to the end of the string, compiled and uploaded to the device. After the update+restart the log output does NOT display the text i included ! It prints the original message as if i never messed with the “network.c” source (and the text is saved there, i checked). Do you have any clues on why that happens ? Seems the source files are not being recompiled, but why ? BTW: did you know that if you press enter on the serial terminal, you get shell access to the OS ? Serial output: MulticastFilterTableInsertEntry: already in Members list. Well, seems there was something wrong with 1.06 build that it was ignoring network.c compilation. I compiled 1.08 GPL Source (Ubuntu 12.04.5) and my test worked. Now it outputs the correct message on the console. Anyway, seems D-Link discourage wireless tweaks (and they should), because the Makefile just ignore the “wireless” build. Instead it just copies “wireless_normal” to “wireless” and install it to the image in the end. I’m trying to force it to build the wireless module so i can fix to specific channel and disable WPS pin (it’s vulnerable to PixieWPS attacks).